“The No. 1 reason for buying Kia models in Europe is design,” says Kia Europe marketing boss Benny Oeyen. The weak European market is slowing Kia's growth plans in the region. A target of 3 percent market share, originally set for 2013 and then delayed to 2015, has been postponed to 2016 or 2017. Nevertheless, Kia expects European sales to rise 13 percent to a record 340,000 units this year. Perhaps even more impressive, the company expects modest sales growth in Europe next year when the region's slump is expected to continue or even worsen. Benny Oeyen, Kia Europe's head of marketing and product planning, discussed the brand's challenges with Automotive News Europe Editor-in-Chief Luca Ciferri. How has Kia defied the European downturn, growing sales nearly 21 percent to 257,760 units through September? Product, product and product. In each of Europe's four key volume segments, A-B-C-D [minicar, subcompact, compact and mid-sized], our range has been renewed in the last 16 months. Adding our strong-selling Sportage compact crossover to the mix, the average age of Kia's core models is below two years. Can Kia grow in a market that continues to decline? This year we plan to sell 340,000 units, up from 293,960 last year. We are currently reviewing our forecast for next year. We expect the market to remain very weak, but we envisage small growth for Kia anyway. 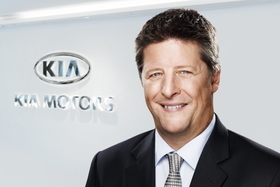 MAIN CHALLENGES: Grow Kia's European sales to a 3 percent share despite a slumping market; expand brand. CAREER HIGHLIGHTS: Joined Mazda Europe in 1990, and then worked for Ford and Chrysler in Europe. In 2001 moved to Detroit as Chrysler international product manager for export markets. Returned to Europe in 2004 as DaimlerChrysler Switzerland managing director. From 2007 to 2009, he was director global product marketing and strategy at Chrysler's U.S. headquarters. Joined Kia Europe May in 2009. Have you given up on your goal of selling 450,000 units a year by 2015, with a market share of 3 percent? So far this year we are at a market share of 2.7 percent, and a 3 percent share remains our mid-term target. We can reach that by 2016 or 2017 at the latest. The unit sales will depend on the market: to get 450,000 units from a 3 percent share, you need a 15-million unit market. Are low prices the main reason many Europeans buy Kia models? Independent research shows the No. 1 reason for buying Kia models in Europe is exterior design, followed by maintenance cost and warranty. Price comes third. How are your models priced compared with Europe's volume brands? In terms of list price and adjusting for equipment, we are 3 percent to 5 percent cheaper. But since we offer lower incentives, our transaction prices are basically on par. In Europe, we systematically monitor Ford, Opel/Vauxhall, Peugeot, Citroen, Renault and Toyota. As a benchmark, we also check our parent, Hyundai. Which brands are most of your customers are coming from and what is your conquest rate?? Our largest group comes from weaker European brands, such as Opel/Vauxhall, Renault, Peugeot, Citroen and Fiat. Our second-largest group includes people who already bought an Asian brand. They left Toyota because of their quality problems, or they are looking for an alternative to Japanese brands currently having difficulties in Europe, such as Mitsubishi, Suzuki, Honda and Mazda. Seventy-five percent of our clients are new to the brand. This is still high, but better than five years ago, when we basically did not have a Kia customer base. Two years ago, Kia said "Our products are better than our brand image." Now? Our brand perception is starting to take off, but the product moves up quicker than the brand. Look at the new Rio subcompact: the product is taking off like a jet fighter, but the brand image takes off like a cargo plane. Kia has sponsored soccer championships to increase its brand awareness. Is this paying off? Yes, our brand awareness is on a constant rise, but still relatively low. In research on unaided awareness, about 26 percent of respondents say they know Kia. This compares with 40 percent for other European volume makers, with Ford slightly above this average. VW is from another planet. In several markets, they're close to 100% in unaided awareness. Some European automakers are extending their model life cycles to save cash during the current downturn. Kia is not. We keep our five- to six-year average life cycle, with refreshment normally in the fourth year. There is nothing better than fresh products to attract new customers during market downturns. Kia comes first in Europe in terms of warranty length. How did your seven-year coverage help your growth here? Enormously. It reassured customers who liked the product but felt unsure about Kia's quality and availability of spare parts. What is the current level of incentives in Europe – and Kia's? There are huge differences between markets for mainstream brands in mainstream segments. On average, I would say incentives are close to 18 percent. Kia's incentives generally are lower than the market average. Does Kia need more dealers in Europe? We have 2,000 dealers and we are fine with that number. We want some of them to revamp their facilities. Are you asking dealers to upgrade facilities during such a severe market downturn? We ask for a fresh, clearly recognizable exterior design that we call the red box. It is a rational investment; we are not pushing them to build cathedrals in the desert. What should be a Kia dealer's top priority? To improve the customer experience for Kia customers everywhere in Europe. We are still a conquest brand, but soon we will become a repurchase brand as ownership grows. [Attracting] a new customer costs many times more than keeping an existing one, so we have to continue improving our customer satisfaction. Eighty percent of the time, a satisfied customer already is in our pocket.